Disc golf is a game played similar to ball golf. Players use a Frisbee type of flying disc to negotiate a course of 21 holes. The object is to make your way from each tee to hole in the fewest number of “strokes”. Our Disc Golf Course begins near the park entrance off of West Market Street, and circles Westover Park. 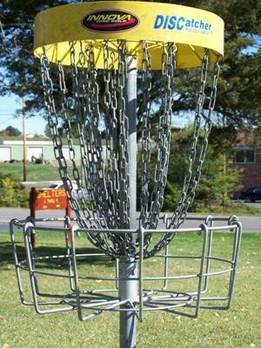 Improvements to the course were made by the Harrisonburg Disc Golf Club in the fall of 2011 to include concrete tee pads to the original 18 holes. Three holes were also added to the front part of the park to allow for some open throws and water hazards. This is a game to be enjoyed by the entire family. Loaner discs are available at the front desk of the CAC. Call 540-433-2474 for more details. *During daylight saving time only. Disc golfers of all abilities are invited to participate in the weekly random pairing. Sign-up every Wednesday by 5:30pm. Players will be randomly paired with a partner and play a Captain's Choice format. This is an excellent way to meet new players and improve your game. If you don't have your own discs, loaners are available. Play will continue through October. This is a free program. 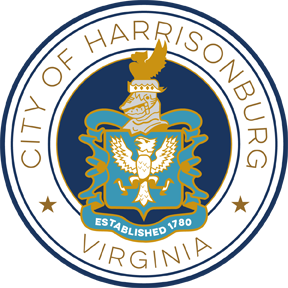 For more information contact Ed Steele at 540-438-1644 or Ed.Steele@harrisonburgva.gov. Disc golfers who are interested in a competitive outlet should sign-up for this program. Players are ranked from the top to the bottom. Lower ranked players may challenge higher ranked players. Winner takes the lowest number, and the loser takes the highest number. Each player will receive a "bag tag" indicating their standing in this informal league. 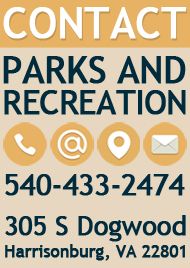 The entry fee will go towards the Rocktown Disc Golf Club activities and course improvements. Bag Tag is held on Monday evenings starting at 5:30pm, and Saturday mornings starting at 10:30am at the Westover Disc Golf Course. Contact Ed Steele at 540-438-1644 or Ed.Steele@harrisonburgva.gov.